Don’t film yourself doing drugs and send it to anyone basically. I don’t think it’s ever a good idea to film yourself doing drugs and send it to someone because you never know when that video is going to come back and haunt you. 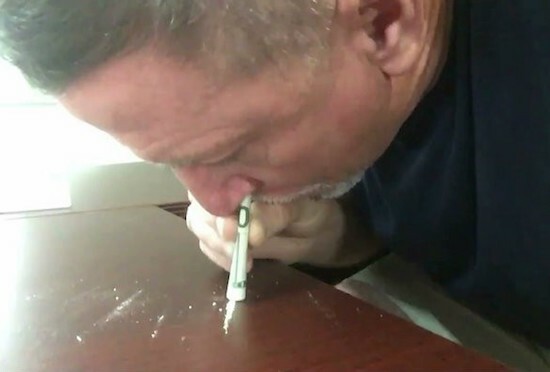 Case in point – this guy Chris Foerster, who is apparently the offensive line coach for the Miami Dolphins. Or at least used to be, because I doubt he’s going to have his job for too much longer thanks to this leaked video. Seriously, recording that video has got to be the worst idea of that guy’s life, shortly after doing three lines of blow and heading into a meeting. I mean do girls even find videos of guys snorting coke attractive? I can’t really see the appeal personally, but maybe there is something to it there. Hope it was worth losing his job and ruining his life though. For more people caught on camera doing blow, check out this guy in the crowd on Sky Sports doing a cheeky dab. Busted.